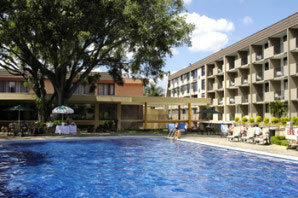 Located just fifteen minutes from Costa Rica's international airport and five minutes from downtown San Jose, the Best Western Irazú is characterized by its Best Friendly Costa Rican Atmosphere: comfortable, lively and entertaining. A wide variety of events and services make the Irazú Hotel the perfect place for vacationers and business executives alike. The hotel offers 325 air conditioned rooms all include a full bathroom with tub, hair drier, U.S. cable television, telephone and safe deposit box ($3 per night). 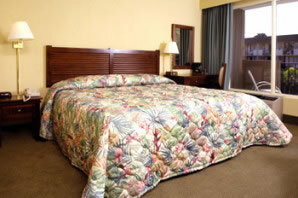 Choose from two double beds, one double and one single, one queen size or one king size bed. Most rooms have a balcony overlooking the swimming pool or gardens. Other services include an outdoor pool, lighted tennis court, sauna, massage service ($30), one of Costa Rica's largest casinos, souvenir shop and nearby shopping center. Various conference rooms will host over 500 people for seminars and meetings. Guests can enjoy complimentary: 24 Hour coffee served in the lobby, while "La Cantina" bar offers , one hour of open bar from 5pm to 6pm, a pool view and live music, with a wide variety of local and international drinks from 10:00 a.m. to midnight and transportation from the hotel to the airport on a scheduled basis, local calls and Internet access..
Free happy hour at the "La Cantina" bar (drinks from the house, alcohloic and non– alcoholic) from 5:00p.m to 6:00p.m every lodging day. Free local phone calls and Internet access.